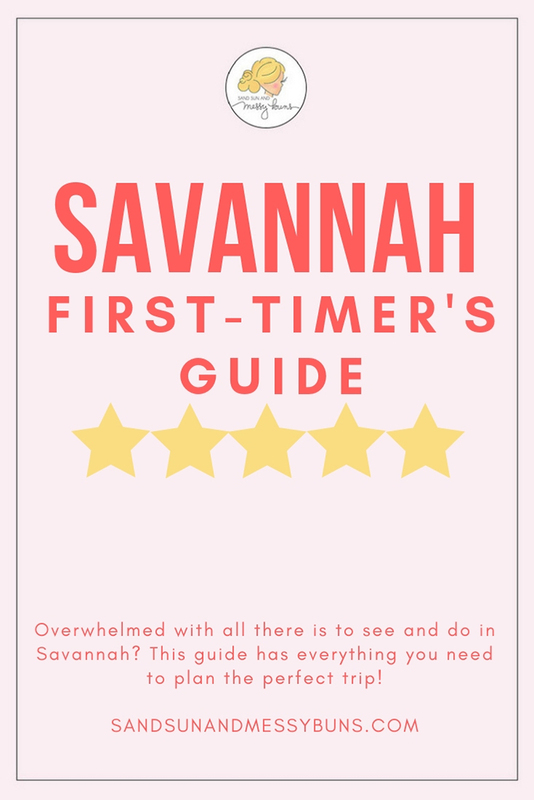 Ok, friends, can I just tell you how excited I am that my Savannah First-Timer's Guide is finally finished? I poured my heart and soul into it, and I'm so happy to be able to share my love of Savannah with first-time visitors. I listened intently to all of your questions, and I made sure to include everything you requested in the ebook. It has tips to help you decide where to stay, a downloadable Savannah Historic District map to help you get around, insider info on all the “must-see” attractions, and so much more! 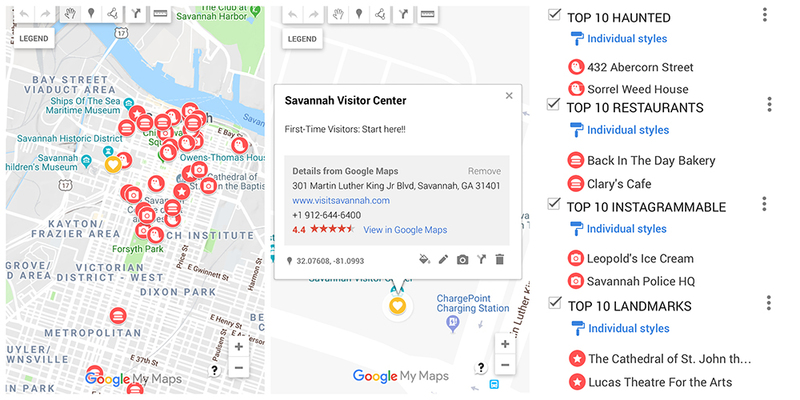 To celebrate that it's finally finished, I thought I'd share a summary of some helpful tips to make planning your first trip to Savannah a little easier. Spring is by far the prettiest time of year, but it's also the most costly. My personal favorite months are late February/early March and late October/early November. Pros: Spring in Savannah is undeniably beautiful. 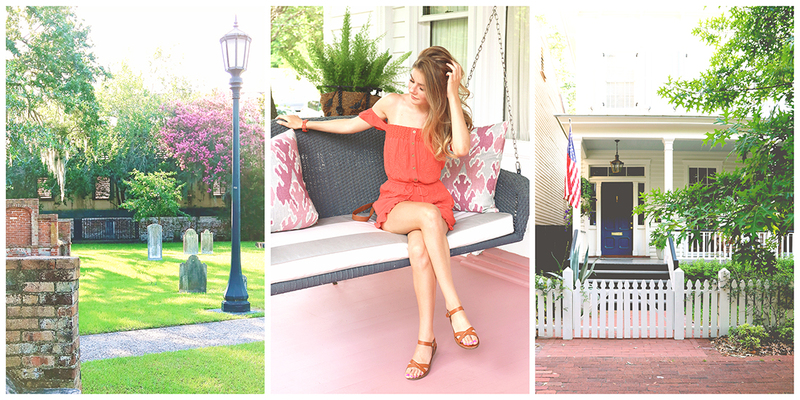 It's one of the prettiest places you can visit in the South, in my [slightly biased] opinion! The entire city is covered in color from all the blooming azaleas and dogwoods. [ Left ] Even Savannah's cemeteries look pretty when Spring rolls around! [ Center ] Spring is what we call “front porch weather” in Savannah. (We also refer to it as “tourist season”.) 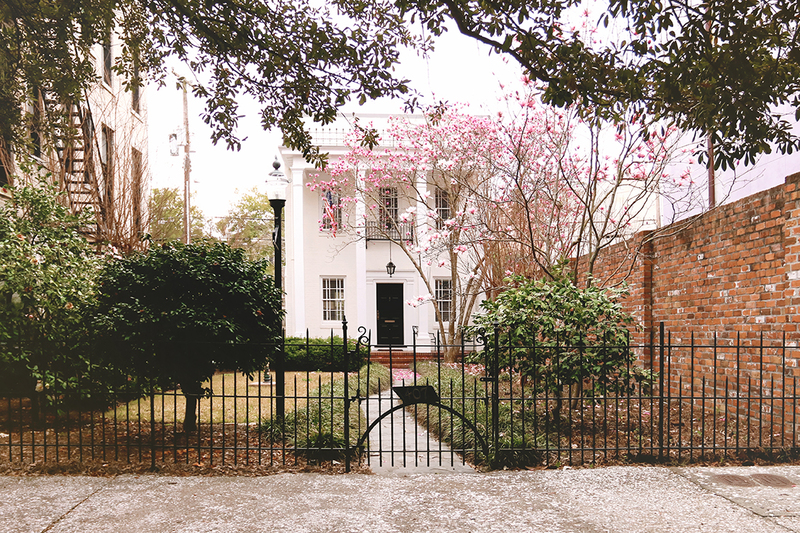 [ Right ] The majority of the homes in Savannah's Historic District have welcoming front porches meant for enjoying the weather. Cons: This won't come as a surprise to anyone who knows me, but summer is my LEAST favorite time to be in the city. Savannah is a coastal town, so it gets extremely hot and humid during the summer months. Expect temps in the 90s to 100s and air that feels hot and sticky. Pros: Fall is an amazing time to visit! September and early October still feel like summer, but anytime around Halloween or later is pretty fantastic. As a bonus, many businesses and homeowners pull out all the stops with seasonal decor! The historic homes look really beautiful when their entrances are lined with pumpkins and there are colorful fall wreaths on the doors. The ghost factor is a draw in October, too; Savannah is one of the most haunted cities in the United States! Even if it weren't, all the old houses and Spanish moss hanging from the trees provide an eerie backdrop for trick-or-treating. Cons: Crime is a problem in Savannah, so it's not the best place to take kids trick-or-treating. Also, it can get crowded due to some of the popular (for good reason!) events hosted during the fall season — Rock & Roll marathon, Pride, the Savannah Film Festival, etc. Pros: Early December is surprisingly nice in Savannah. I've had many moments where I ventured out with only a light jacket with me to keep warm. Also, the city looks beautiful all dressed up for the holidays! I particularly love Broughton Street when the entire length of the street is lined with twinkly lights and Christmas wreaths. Cons (kind of): January and early February are the “bitterly cold” months around here, but you'll probably only feel that way if you're from down South — aka: further south than Savannah — or are otherwise sensitive to the cold. The temps warm up fast the second half February, and you'll actually see blooms on many of the plants. It's a highly underrated time of year and one of my super-secret best times to visit! Another perk is that you can usually find the best hotel rates in January and February. No joke…this pic was taken on February 10th of 2018, and the pink tulip trees were already blooming like crazy. In early FEBRUARY! I tell anyone who will listen that the last 2 weeks of the month are a pretty fantastic time to visit. You'll avoid the crowds AND pay less for accommodations. In my ebook, I included all of my very best insider tips about each season to help you avoid the crowds and score the best deals! I thought long and hard about the map portion of the ebook, since a good map is essential when you're new to an area. I don't know about you, but I'm terrified of getting lost in sketchy areas of an unfamiliar town! I finally decided to go with an interactive map, since you guys are already using and loving my River Street one. [ Left ] Zoomed out image of the Savannah Historic District Map [ Center ] Click on any icon to pull up the address, website, and phone number — plus reviews! — of the location. [ Right ] Cute icons help easily distinguish between haunted locations, restaurants, landmarks, and more. 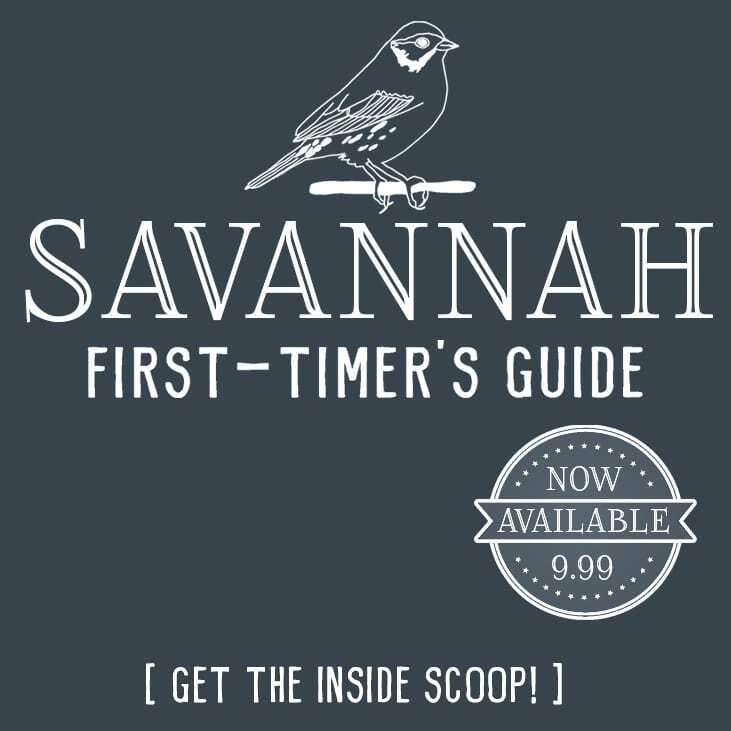 You can purchase the Savannah First-Timer's Guide here. I had fun with the icons, so everything's very easy to find. Want to see the top 10 haunted spots? Just look for the ghost icons! Interested in the top 10 restaurants? Those have hamburger icons. The top 10 most Instagrammable locations are marked with camera icons. The top 10 landmarks are labeled with stars. The Visitor Center is marked with a yellow heart, so it's always easy to find! SIDE NOTE: In my pre-blogger life I worked as a corporate event planner, so I'm in my element when I'm anticipating every little thing you might need prior to your trip and then delivering it BEFORE you even realize you need it! 21 Truly Helpful Tips to Know Before You Go! Don't over-schedule your day. Savannah is a slow-paced city, and you'll get the most enjoyment from it when you're relaxed. Pull up a chair at one of the many outdoor cafes, sip on your favorite drink, and immerse yourself in the charm of the city. Bring your comfiest shoes! Trust me, you'll want to keep your feet happy. There are brick-lined sidewalks and cobblestones streets throughout the city, so heels aren't ideal. Consider tucking a few bandages in your pocket each day, just in case. A friend of mine recently came to visit and was surprised when her Fitbit showed she walked 9 miles her first day in town! Take advantage of pedicabs and hop-on/hop-off trolley tours to get around town when you tire of walking. That way you can take lots of pictures and learn from the tour narrator as you venture from place to place (something you can't do when you're stuck behind the wheel of a car). If you must drive, learn how to properly drive around the squares. The car already on the square has the right of way, while cars entering the square should yield. Pack lightweight layers — even during the summer months. Restaurants tend to blast their air conditioners, and it's easy to get cold when you're sweaty from exploring. Schedule visits to the museums and historic homes during the week when it's less crowded. Know that you'll need to pay close attention to street signs. The Historic District has numerous one way streets, so it can get confusing. Strategically plan where you want to stay prior to booking your hotel! River Street and Broughton Street tend to be very busy and close to the action, while a few of the residential areas within the Historic District are more romantic and often better suited for couples. Where you choose to stay makes a BIG difference in Savannah. Chat it up with the locals! Southerners are notoriously chatty, so don't be afraid to make conversation with the person next to you in line. (You never know…it could be me!) It's a great way to learn about all the current hotspots. Speaking of friendly…Savannah is a notoriously pet-friendly city. There are lots of outdoor cafes where pets are welcome year-round, and many of the hotels are pet friendly, too. All the parks have “poo pots” where you can easily dispose of…well, you know. Savannah is one of only a handful of cities in the U.S. where it's legal to “Take One To Go”, which means it's perfectly legal to catch a buzz while you're exploring the Historic District! If you're anywhere north of Jones Street, you can fill a 16 oz. cup with alcohol and wander the streets with a drink in hand. If you prefer to save money and mix your own drinks back at your hotel, go stock up on liquor at Jonnie Ganem's on Habersham Street. If you're the type of person who likes to study up on a city prior to visiting, I've compiled a list of the best books and movies about Savannah. Midnight in the Garden of Good and Evil gets my vote as the most entertaining option! Speaking of…Midnight in the Garden of Good and Evil is both loved and hated around these parts. If you visit the Mercer-Williams House (where the alleged murder took place), don't be surprised when they try to steer you away from the topic. While we're discussing topics people like to avoid, let's talk about crime in Savannah. First-time visitors often want to know if the city is safe, since it's garnered a slightly sketchy reputation over the years. Anytime you're visiting a new city, you should always take common-sense precautions such as locking your car and not walking in dark alleyways or through the parks alone at night. That advice holds true when you're visiting Savannah. The Historic District is generally safe when it's bustling with activity, but I'd exercise caution once the sun goes down and the number of people begin dwindling. River Street, City Market, and Broughton Street are generally busy in the evening, and you should feel safe as long as you're surrounded by other people. Many of the squares in the true Historic District are also well-trafficked. I avoid walking through Forsyth Park at night and stick to busier streets, such as Bull Street. Wherever you are, make note of those around you and head indoors when you notice the streets emptying of people. Savannah may look like a romantic city, but it's not the safest place go for a late-night stroll. Tybee Island, aka “Savannah's Beach”, is not actually located in Savannah. It's a 15 – 20 minute drive away, and you'll definitely need a car to get there. A few of the city's most well-known attractions are also not within walking distance of the Historic District. Wormsloe Plantation, Bonaventure Cemetery, and Fort Pulaski are each worth seeing, but you'll need a car to get to them. If you plan to see those attractions, a one-day car rental costs less than the Uber fare you'd pay to get to all three locations. Speaking of needing a car, first-time visitors to Savannah often want to know about the best day trips in the area. Bluffton, SC, is the closest nearby city I'd suggest, and it's about 30 minutes away. Hilton Head is an hour away and is a very family-friendly destination. Charleston is beautiful, but note that it's about 90-minutes away and you'll probably want to stay overnight if you go. Here's a handy bucket list of nearly 40 things to do in Charleston if you do decide to go. Many of the nearby islands are beautiful and unique, and well-worth a visit. (I could probably write an entirely new ebook about the surrounding Lowcountry and all the things there are to see and do in the area!) If you're a history buff, Daufuskie and Saint Helena Islands are musts! The Penn Center on Saint Helena island is a historically significant landmark and was one of the first schools in the country to provide an education for the formerly enslaved. 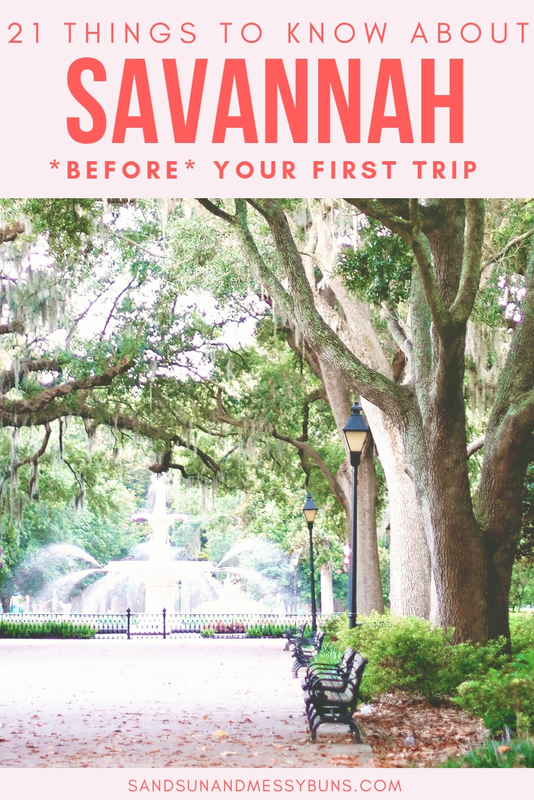 Realize that you won't be able to do and see everything you want during your first trip to Savannah. The city is full of so many cultural and historic sites that you'd need weeks to take them all in and properly enjoy each one. Once you come to terms with that realization, you can adopt the “slow-vannah” way of life and simply savor each moment of your vacation at a relaxed, Southern pace. Let's face it, the main thing you need to know about Savannah is that you're going to want to plan a follow-up trip as soon as possible! Make peace with that now, and then start setting aside some money to plan your next visit. It’s pretty incredible. And thank goodness it’s so walkable, since my favorite Southern foods tend to be pretty fattening. What a great guide! The historic district looks so densely packed with so much to do and see. I love that you highlighted by season, too. So charming!